Samuelson is among the last generalists to be incredibly productive in a number of fields in economics. He has contributed fundamental insights in consumer theory and welfare economics, international trade, finance theory, capital theory, dynamics and general equilibrium, and macro-economics. Swedish economist Bertil Ohlin had argued that international trade would tend to equalize the prices of factors of production. Trade between India and the United States, for example, would narrow wage-rate differentials between the two countries. Samuelson, using mathematical tools, showed the conditions under which the differentials would be driven to zero. The theorem he proved is called the factor price equalization theorem. In finance theory, which he took up at age fifty, Samuelson did some of the initial work that showed that properly anticipated futures prices should fluctuate randomly. Samuelson also did pathbreaking work in capital theory, but his contributions are too complex to describe in just a few sentences. Economists had long believed that there are goods that the private sector cannot provide because of the difficulty of charging those who benefit from them. National defense is one of the best examples of such a good. Samuelson, in a 1954 article, was the first to attempt a rigorous definition of a public good. In macroeconomics Samuelson demonstrated how combining the accelerator theory of investment with the Keynesian income determination model explains the cyclical nature of business cycles. He also introduced the concept of the neoclassical synthesis—a synthesis of the old neoclassical microeconomics and the new (in the 1950s) Keynesian macroeconomics. According to Samuelson, government intervention via fiscal and monetary policies is required to achieve full employment. At full employment the market works well, except at providing public goods and handling problems of externalities. james tobin called the neoclassical synthesis one of Samuelson’s greatest contributions to economics. In Linear Programming and Economic Analysis Samuelson and coauthors Robert Dorfman and Robert Solow applied optimization techniques to price theory and growth theory, thereby integrating these previously segregated fields. Samuelson began teaching at the Massachusetts Institute of Technology in 1940 at the age of twenty-six, becoming a full professor six years later. He remains there at the time of this writing (2006). 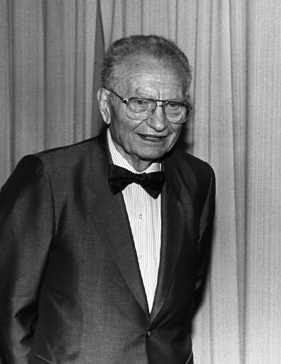 In addition to being honored with the Nobel Prize, Samuelson also earned the John Bates Clark Award in 1947—awarded for the most outstanding work by an economist under age forty. He was president of the American Economic Association in 1961. Samuelson was born in Gary, Indiana. At age sixteen he enrolled at the University of Chicago, where he studied under Frank Knight, Jacob Viner, and other greats, and alongside fellow budding economists Milton Friedman and George Stigler, who were then graduate students. Samuelson went on to do his graduate work at Harvard University. Samuelson, like Friedman, had a regular column in Newsweek from 1966 to 1981. But unlike Friedman, he did not and does not have a passionate belief in free markets—or for that matter in government intervention in markets. His pleasure seemed to come from providing new proofs, demonstrating technical finesse, and turning a clever phrase. 1938. “A Note on the Pure Theory of Consumers’ Behavior.” Economica, n.s., 5 (February): 61–71. 1939. “Interactions Between the Multiplier Analysis and the Principle of Acceleration.” Review of Economics and Statistics (May): 75–78. 1947. Foundations of Economic Analysis. Cambridge: Harvard University Press. 2d ed. 1982. 1948 (with William Nordhaus). Economics. 18th ed. New York: McGraw-Hill, 2004. 1948. “International Trade and the Equalization of Factor Prices.” Economic Journal 58 (June): 163–184. 1954. “The Pure Theory of Public Expenditure.” Review of Economics and Statistics (November): 387–389. 1958 (with Robert Dorfman and Robert Solow). Linear Programming and Economic Activity. New York: McGraw-Hill. Stanley Fischer, “Paul Anthony Samuelson,” in John Eatwell, Murray Milgate, and Peter Newman, eds., The New Palgrave: A Dictionary of Economics, vol. 4 (New York: Stockton Press, 1987), p. 235. Arjo Klamer, Conversations with Economists (Totowa, N.J.: Rowman and Allanheld, 1983), p. 49.